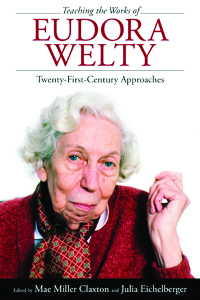 Contributing authors to Teaching the Works of Eudora Welty: Twenty-First Century Approaches will participate in a panel discussion about their experiences, tips, and techniques on Thursday, February 7, from 4:30-6:30 p.m. at the Eudora Welty Education and Visitors Center. Contributor Suzanne Marrs, Millsaps College Emerita Professor of English and former Welty Foundation Scholar-in-Residence, will moderate the discussion. Participants include Carolyn Brown, St. Andrews Episcopal School English teacher and author of A Daring Life: A Biography of Eudora Welty; Lee Anne Bryan, former Education and Outreach Specialist, Welty House and Garden, now Millsaps Executive Director of Alumni and Parent Relations; Ebony Lumumba, Chairman of the English Department at Tougaloo College and a former Welty Foundation Graduate Research Fellow; Pearl McHaney, Kenneth M. England Professor of Southern Literature at Georgia State University and award-winning editor of several books on Welty; Gary Richards, Associate Professor of English and Chair of the Department of English, Linguistics, and Communication, University of Mary Washington; Annette Trezfer, Associate Professor of English at the University of Mississippi and co-editor of four books of essays on William Faulkner; and Alec Valentine, English instructor at the community college level for 31 years and a dedicated docent at the Eudora Welty House and Garden. The event is free with no reservations required. Metro-area English teachers have received special invitations to attend, and the public is also invited. A reception will follow, and the Welty House and Garden store will have copies of the book for sale. Published by the University Press of Mississippi, the book was the subject of a popular panel discussion at the 2018 Mississippi Book Festival. Shown here are from left, Pearl McHaney, Ebony Lumumba, Harriet Pollack, Professor Emerita at Bucknell University and the author/editor of several books on Welty; Mae Miller Claxton, Associate Professor of English at Western Carolina University and Co-edtior of the Teaching the Works of Welty book; Julia Eichelberger, Marybelle Higgins Howe Professor of Southern Literature at the College of Charleston and Co-editor of the book; and Suzanne Marrs.